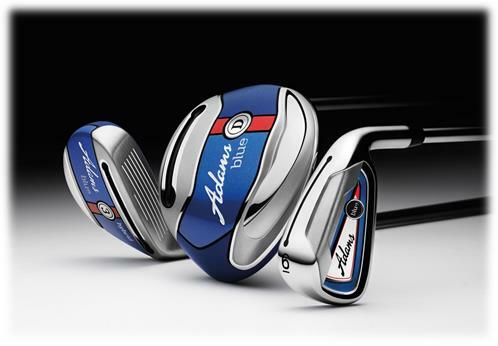 Adams Golf, which introduced a Red hybrid club this past January, has launched the Blue line of clubs that include driver, fairway, hybrid and combination iron set. Each piece in the Adams Blue set, according to the company, was created to help golfers get the ball in the air more easily and more consistently. The new Blue line looks to be a next generation of sort of Adams Golf’s highly successful Idea line of clubs that helped bring the company into the mainstream several years ago. The first feature of the Easy Launch System is the Velocity Slot Technology on the soles of the clubs, which Adams Golf says delivers more flex from the clubface and produce more consistent ball speed at impact. The company says this leads to improved distance and accuracy, resulting in increased enjoyment for a wide range of golfers. Adam golf says the Easy Launch System also implements low/back CG, which can be found in all metalwoods and irons throughout the Blue lineup. By keeping the center of gravity low and as far back as possible, it allows for higher launch, more spin, and ultimately more air time on all shots. Blue’s CG (center of gravity) placement, Adams Golf says, will help many swing speeds and swing styles achieve optimal launch conditions. In addition to the Velocity Slot Technology and low/back center of gravity, new Adams SlimTechMshafts have been integrated into Blue, utilizing narrower shaft tip diameters to promote lower kick points and high launch conditions from any lie on the course. The Blue driver and fairway woods, for example, each feature a .320mm tip (vs .350 in most standard products) while the hybrids and irons each have a 350mm tip (vs .370 in most standard products). The Blue driver (9.5, 10.5 and 12 degrees) will carry a suggested retail price of $299; the Blue fairway woods (15, 19, 22) each will have a SRP of $199, while Blue Hybrid (19, 21, 23, 25) will carry a SRP of $179 each. Blue Irons are sold as a combination set including a 3 and 4 hybrid along with the 5-iron through pitching wedge at a SRP of $699 (steel) and $799 9graphite).